SAN DIEGO, September 18, 2018 – In December 2017, Civic San Diego (CivicSD) closed a $12.6 million New Markets Tax Credit investment to Goodwill Industries of San Diego County to fund improvements to the two buildings in San Ysidro to repurpose them as an outlet center and a distribution facility and to make improvements to an existing storefront in San Ysidro to add a Community Employment Center. 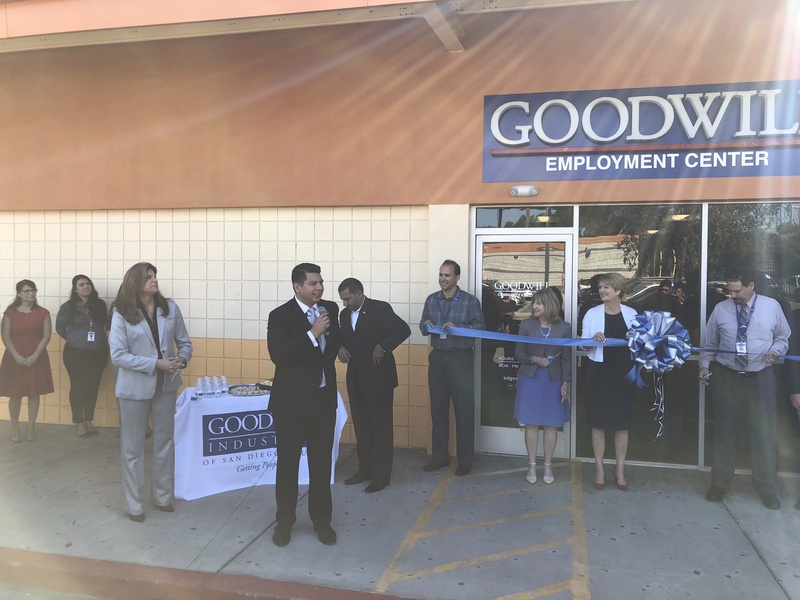 Today, Goodwill Industries unveiled to the community the new employment center that it calls its starship in the south bay. “We are very grateful to Civic San Diego for helping us financially support this project through the funding of New Market Tax Credits,” said Toni Giffin, Goodwill San Diego's president and CEO. In 2012, CivicSD formed the Civic San Diego Economic Growth and Neighborhood Investment Fund to become certified as a Community Development Entity. The main role of the Community Development Entity is to secure New Markets Tax Credit funds as well as manage Qualifying Low-Income Community Investments to continue the work of revitalizing San Diego’s underserved neighborhoods. CivicSD has received four allocations of New Markets Tax Credit totaling $133 million from the United States Department of the Treasury. Congress established the New Markets Tax Credit program in 2000 to drive investment in both businesses and real estate projects in low-income communities. The program attracts investment capital to these communities by allowing corporations and individuals to receive a credit against their federal income taxes in exchange for making direct equity investments in entities such as CivicSD. With the new Goodwill facilities, for instance, CivicSD provided $12.6 million in New Markets Tax Credits that were then purchased by Capital One to provide flexible financing to support the acquisition of buildings and the tenant improvements to open the new outlet store and employment center that will be a benefit to the San Ysidro community. CivicSD is a nonprofit, public-benefit corporation created by the City of San Diego to engage in economic development, land use and permitting services, and project management services. Goodwill Industries of San Diego County is a not-for-profit community organization that provides employment and training opportunities to people with disabilities and other barriers to employment. In addition, Goodwill offers free employment services through Goodwill Employment Offices and Centers to anyone in the community who is looking for a job. Our goal is to improve employability and help individuals gain independence and financial security.